Last week Bloomberg published an article about Cisco Systems that made me sad. It describes the effects of a management process put in place shortly after I left the company. According to the article, it has slowed down the company, led to executive resignations and damaged the predictability of quarterly results. 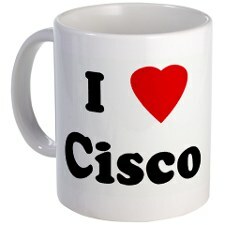 For those of you who know me, you know that I think Cisco was the best company I have ever worked for. I often talk about various aspects of the company culture that made it a great place to work. I still view it as a benchmark from which other companies should learn and for which they should strive. The burst of the dot-com bubble certainly had an effect on the company, prompting some needed changes. However, it seems the pendulum swung too far. In the time I was associated with Cisco, both as a supplier and as an employee, it was a huge company (around 50,000 people worldwide) that could turn on a dime – and took pride in that fact. Top down direction of business goals and values were communicated clearly and often. Everyone understood the priorities for the business and we were all shareholders, so we were invested in our success. The majority of the company was experienced professionals, so we all knew our roles and we had the autonomy to make decisions in our respective areas. I believe the last point was one of the main reasons for Cisco’s renowned agility and made it a great place to work. This autonomy extended to all levels, which likely led to some of the redundancy of products and components during the boom days and we weren’t running at peak organizational efficiency in all areas. Still, that culture made Cisco very successful. Even with less than optimized operations, the company was able to build up sufficient reserves to not only survive, but thrive (relative to most competitors) after the dot-com bubble burst. Cisco Systems and the people I worked with had a profound effect on my career and played a significant role in shaping the leader I am today. Not only did I get really good at getting things done, I learned that I must always keep focus on the customer, how to influence without authority, and how to work as a team even if everyone is scattered around the globe. I also learned that frugality as one of the company values was a good idea, as long as you reminded everyone once in a while. As the Bloomberg article mentions, Cisco did need to improve collaboration between units and product lines. The council system, evidently, was too contrary to the company culture. Even if I wasn’t a shareholder, I would still be a proud Cisco Alumnus. I hope Cisco rediscovers and leverages the values that made it great in the first place. Maybe then the management pendulum will swing to a happier medium between the extremes of individual entrepreneurial spirit and bureaucratic control. ← A Week of Awesome! I agree that autonomy is one of the most important elements that creates job satisfaction for employees. Unfortunately too many companies think that tightening the reins will cut costs, but this reduction in employee autonomy leads to preventable losses of highly competent personnel. When will companies learn to collaboration and cooperation with staff is the best solution to improving the bottom line, not control and fascism.